Fredrik Tobin | S. Bell & A. A. Carpino (eds. ), A companion to the Etruscans, Chichester: Wiley-Blackwell 2016. xxviii + 493 pp. ISBN 978-1-118-35274-8. http://doi.org/10.30549/opathrom-10-09. 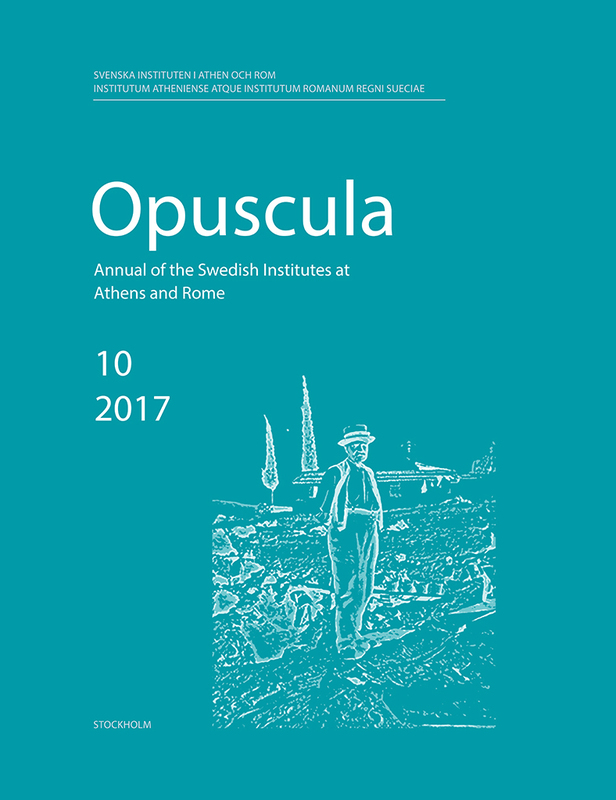 Pedro Bentancour Garin | I. McPhee, Myth, Drama and Style in South Italian Vase-Painting: Selected Papers by A.D. Trendall (Studies in Mediterranean Archaeology and Literature PB 182), Uppsala: Åströms Förlag 2016. xxxix + 299 pp. ISBN 978-91-7081-205-7. http://doi.org/10.30549/opathrom-10-10. Hedvig von Ehrenheim | G. Renberg, Where dreams may come. Incubation sanctuaries in the Greco-Roman world, vols. 1–2 (Religions in the Greco-Roman world 184), Leiden & Boston: Brill 2016. 1046 pp. ISBN 978-90-04-29976-4 (hardback set) ISBN 978-90-04-34621-5 (hardback, vol. 1) ISBN 978-90-04-34622-2 (hardback, vol. 2) ISBN 978-90-04-33023-8 (e-book). http://doi.org/10.30549/opathrom-10-11. ‘Book reviews’, Opuscula. 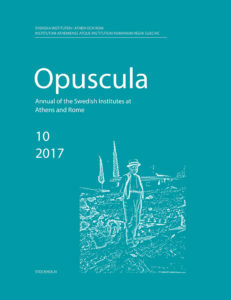 Annual of the Swedish Institutes at Athens and Rome (OpAthRom) 10, Stockholm 2017, 190–195. ISSN: 2000-0898. ISBN: 978-91-977798-9-0.